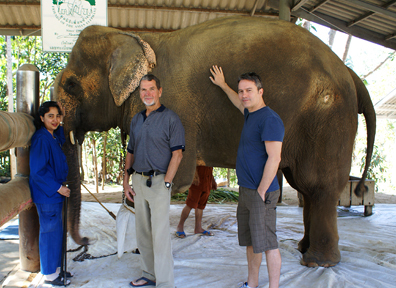 Yesterday Chang Lek and visiting friend Richard Wofford and I drove south of Chiangmai, where I live, to Friends of the Asian Elephant Hospital near Lampang Thailand. We began with a very nice conversation with founder and Director-General Soraida Salwala about the hospital, the very cool weather that is currently delighting all of us. It was a magnificent day. We first meandered down to say hello to Motala, a large forty-four year old elephant who has been under the hospital’s care for more than a decade. Motala had lost one of her front legs to a land mine on the border between Thailand and Myanmar (Burma). The event drew world-wide attention and an outpouring of veterinarians, doctors, news journalist and well-wishers arrived on the scene from all corners of the earth to help save the elephant’s life. And indeed her life was saved. And over the years many others have donated their time and expertise; orthopedic surgeons working to develop a prosthesis that would allow Motala better mobility. The first one was simply not strong enough to carry her enormous weight. 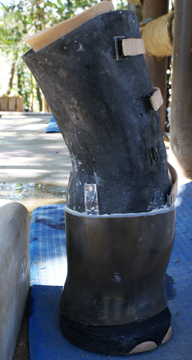 The second one (shown here) was developed with a more natural leg curve, but Motala finds it uncomfortable; though it looks more natural, the balance is wrong. Now she’s waiting for her final model with which she can move freely about the compound visiting other patients. Another land mine victim, Mosha, has just been relocated near Motala. Mosha is only about four years old. She stepped on a land mine as a mere baby and she too is able to wear a prosthetic. Although, because of her smaller size and youth, she seems rather agile and moves about with determination on three legs. She is filled with curiosity and a lovely bright spirit. If you ever are in the neighborhood, I very much recommend you visit FAE’s Elephant Hospital. 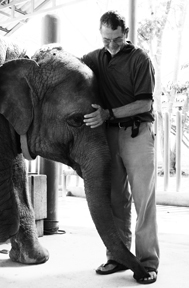 It’s a beautifully quiet place; the affection between elephants and humans is palpable. Not all the elephants are land mine victims. 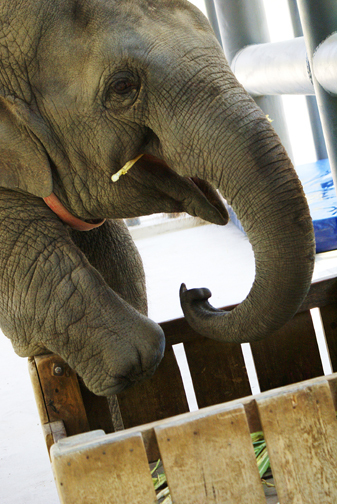 There are as many reasons for elephants to need medical care as there are needs for humans needing medical care. Day by day, week by week, the work goes on. With special gratitude to those who make it happen. My young friend Chang Lek gratefully did the photographs for this entry. 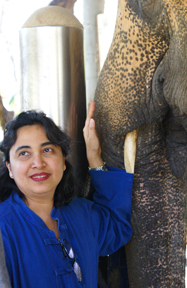 Stay tuned: The next blog will feature a trip to Pai, Thailand and a visit to my very special friend Panom, a lovely elephant with whom I sometimes go swimming in the cool Pai river and for whom I named the ongoing Panom Project. Below is a poem I wrote a few years back. limbs of trees, stoking her endless appetite. zigzagging shallow cliffs, her shadow leading. of flying occurred to both. three meters and arched to the east. rising in the waters of her mother. It seemed that slow. leg a mangle of blood and bones. in the shade of the forest. they had played together. The river, at last, subsided. This entry was a great find as I’m currently in Chiang Mai with a hired car and everywhere to go. I’m in no way interested in going to watch elephants kick footballs or paint pictures, especially not interested in riding one. I know there are good parks out there that care for these giant beasts and help them out by letting them kick footballs and paint as to give them something to do. however, you don’t know if they are doing it out of freedom or out of cruel training. So, without the knowledge on the conditions of these animals I wanted to visit somewhere like FAE and then i stumbled upon this story. May i ask if you had to pay, I assume not. Also, is it easy to drive to?